Summary: Feeling alive is always worth the risk. But Jack is hiding a piece of himself. On midnight rides and city rooftops, Beatrix begins to see who this enigmatic boy really is.Review: That moment when you read a book summary online, and from those three little paragraphs the most strangest thing happens. Your body tingles, your eyes grow wide and that uncontrollable need for that book to be in your hands. 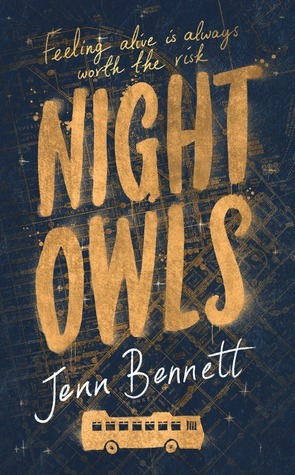 This was the book "NIGHT OWLS" that did that for me. Review: You begin with a story full of mystery and anticipation, you fly through it with its amazing dialogue and romantic artistic scenes, the book makes you feel belonged and celebrated for your talents, You jump with delight at the fast paced scenes, you trust that every chapter is going to get better and better, and you blooming wasn’t wrong. You celebrate the not at all two dimensional characters, you endure its headache but feel all the feels, you rise from it with an amazing out look on life and art, and love that this book made you do all these things. Meeting Jack on the Owl- San Francisco night bus- turns Beatrix’s world upside down. Jack is charming, wildly attractive… and possibly one of San Francisco’s most notorious graffiti artists. Their relationship was so refreshing. Their chemistry the way they would bat off of each other was so endearing and enjoyable. Jenn did a wonderful job with the sexual tension between them both… you were left on edge with them.. will they won’t they? it was very addicting. The use of art in this novel was very interesting… why? well you don’t really see Graffiti and anatomical art used in the same sentence much… you don’t see it working! but my god it did. as well as mental health being a prominent theme in this novel I found it all overwhelming in the best way possible. a page turner, a heart warmer and if you’re having john green withdrawal symptoms then you need this book. You never thought these 10 worlds: BEGIN, FLY, BELONG, JUMP, TRUST, BLOOM, CELEBRATE, ENDURE, RISE, and LOVE from the novel would make you feel every emotional mentioned in the english dictionary.. you’ll see why.